Inhabits river systems and swamps. The areas in which the fish are found are usually characterised by large amounts of aquatic vegetation. 18.4″ (46cm). Usually smaller in aquaria. 48″ x 18′ x 18″ (120cm x 45cm x 45cm) litres, although the width of the tank is far more important than the height. Use piles of rocks and bogwood to form plenty of sheltered areas, but make sure these are secure and will not fall over if the eel burrows under them. It’s best to place items of decor on the tank base before adding the substrate when keeping spiny eels. It’s also essential that the tank bottom is covered in sand, as the fish spends much of it’s time burrowed into the substrate. Gravel is not recommended as it’s sharp edges can damage the eel’s skin. Don’t make the substrate too deep or the eel may disappear for long periods of time. 1″ is an adequate depth. Lengths of plastic piping are also useful to provide the fish with shelter. Plant pots are unsuitable though, as the fish can get trapped in the small hole on the bottom of the pot. There should be no strong currents in the aquarium and dim lighting is also beneficial. Although live plants do mimic the natural biotope of this eel, in the aquarium they will most likely be uprooted by its digging activities. Floating plants and species that grow attached to decor, such as java fern or anubias, can be used of course. A tightly-fitting cover is absolutely essential as if these eels can escape, they invariably will. In nature, it preys on small fish and aquatic inveretebrates but aquarium specimens readily accept dead alternatives. Prawn, cockle, mussel, earthworms and bloodworm can all be offered. Dried foods are rarely accepted. Like others in the genus, it’s quite a shy fish and you may have to add food after lights out for a while until it becomes accustomed to its surroundings. It’s peaceful with species it cannot fit into its mouth, and thus makes a good inhabitant of communities containing larger peaceful species. It does tend to be somewhat territorial with conspecifics, however, and a very large tank is required if more than one is to be kept. No known external distinguishing characteristics, but mature females tend to be thicker-bodied than males. As yet unsuccessful in captivity. One of the newer and prettier spiny eels in the hobby, M. zebrinus was previously considered a member of the closely related Mastacembelus genus. 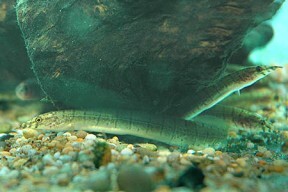 Care should be exercised when handling spiny eels, as the common name is derived from the sharp dorsal rays that can easily puncture the skin of a human. After keeping these for around 10 years it is my opinion these fish only burrow in substrate when threatened, panicked or extremely anxious. This will be seen frequently if they are kept in brightly lit tanks, sparsely decorated with unnatural items. Kept in a dimly lit, heavily planted tank with plenty of bushy leafy plants, they prefer to hang within the planting, staying motionless for hours looking like a twig or leaf. In such tanks they quickly become bold enough to feed during lights on and readily take to frozen foods, however they are seen at their best when hunting suitably sized live foods. These fish are most likely to die from stress or starvation or escaping the tank.